Canada Without Poverty > News > Connect, Connect, Connect! You told us why you think #AlbertaSocialWorkersRock! On Friday, our Executive Director, Leilani Farha, gave the keynote address to the Alberta College of Social Workers at their annual conference. Leilani stressed the importance of building communities through human relationships and connecting with each other in the face of obstacles. “Why do I care about community? Because from what I can tell, solving the systemic causes of the socio-economic issues that many of our clients and constituents are confronted with, requires collective voice and collective action. What we are trying to change and challenge is way bigger than any one of us. We asked the 800 social workers in the room and our supporters across the country to tweet why they think Alberta Social Workers rock or to start a sentence with “I think poverty in Canada…” while including the hashtags #AlbertaSocialWorkersRock and #RightsMatter. The response in the room was powerful. In a country as big as Canada with so many diverse poverty issues, it’s easy to become disconnected from one another. 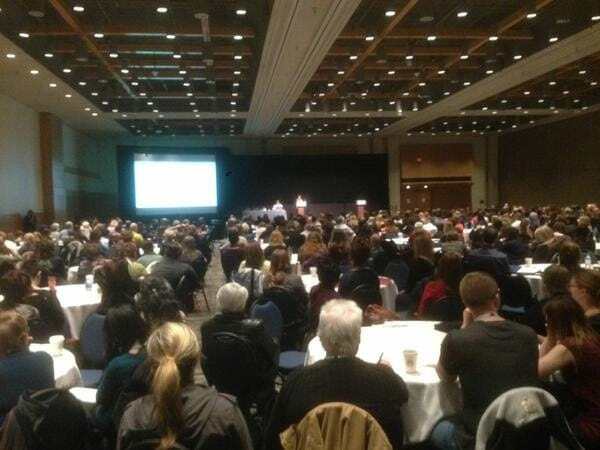 But on Friday, 800 social workers in Alberta connected to people across Canada in a united belief that being free from poverty is a human right. Thank you for helping us continue to build community. Going forward, as Leilani said at the end of her address, let’s not forget to connect, connect, connect.